Are you looking for some new and interesting ways to wrap your Christmas and Holiday gifts this year? If so, have a look at some of these gorgeous suggestions from all around the world! 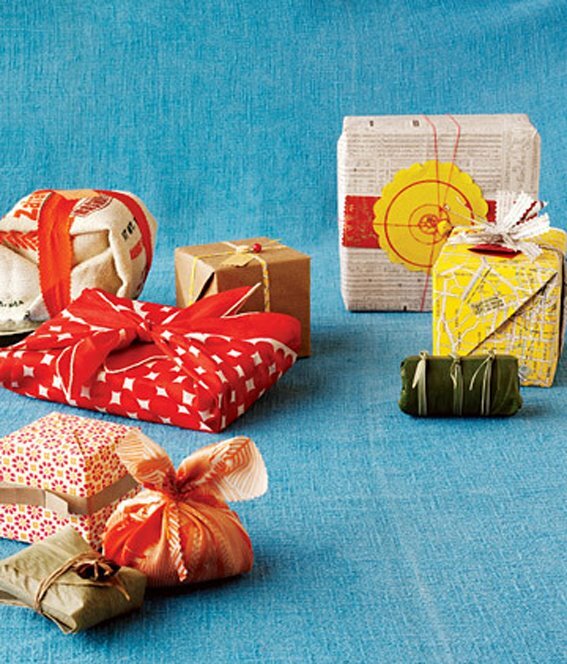 In Japan there is a tradition to present gifts in a wrapping cloth called “Furoshiki”. This is such an important part of life and culture in Japan that the Ministry of the Environment Government of Japan has even posted a PDF guide on using cloth for wrapping gifts. 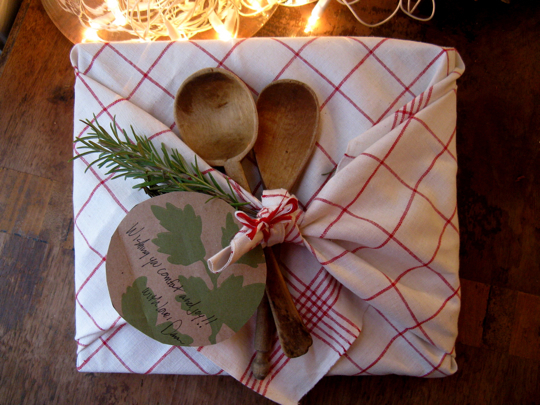 This is such an environmentally friendly way to wrap gifts as you will be cutting down on the paper that is used for gift wrapping and the cloth that is used can then be re-purposed! How nifty and thrifty is that!? 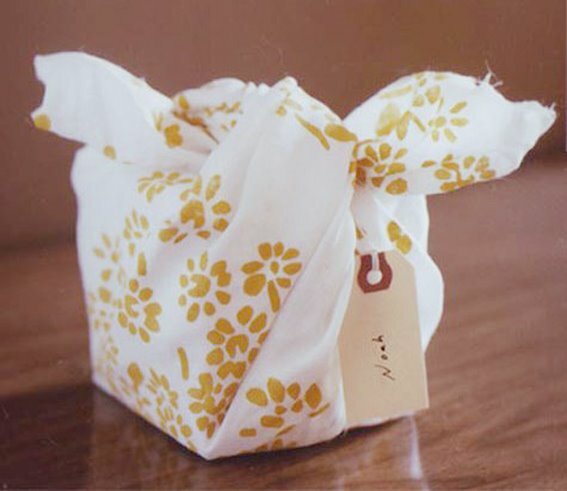 Martha Stewart has a great idea to use vintage Christmas linens to wrap unusually-shaped items. 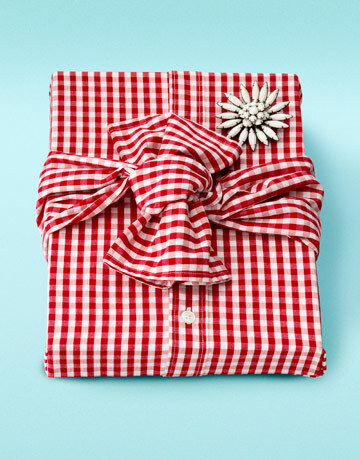 Try to find inexpensive sets of napkins and handkerchiefs at yard sales, estate sales, and markets. 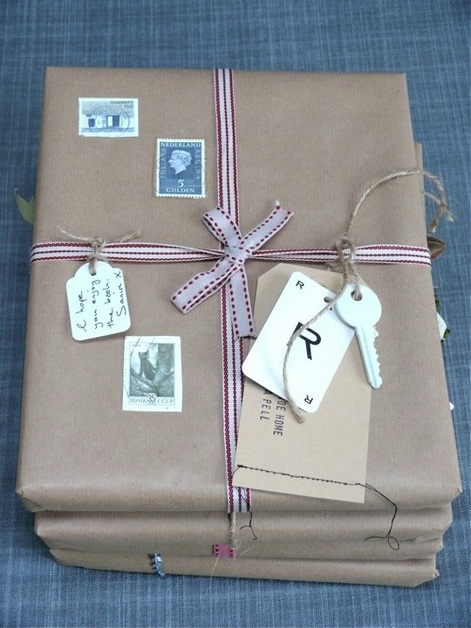 Some Aussie Bloggers have some great gift wrapping ideas. 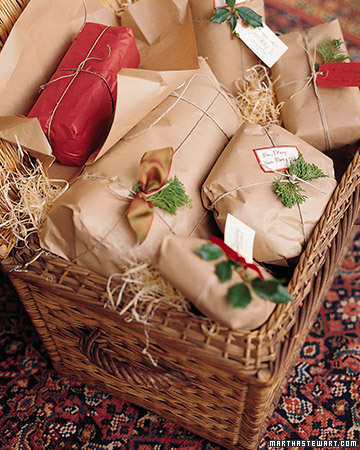 Have you wrapped using aluminium foil or baking paper before? Have a look at these ideas from Mondo Cherry! 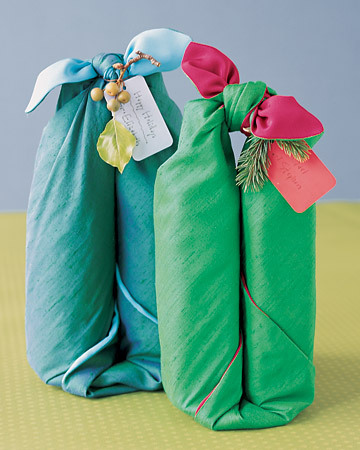 The Martha Stewart Website has these great ideas for wrapping with craft paper. My American friends I'm sure already know that Country Living is always full of fabulous ideas-just look at these! 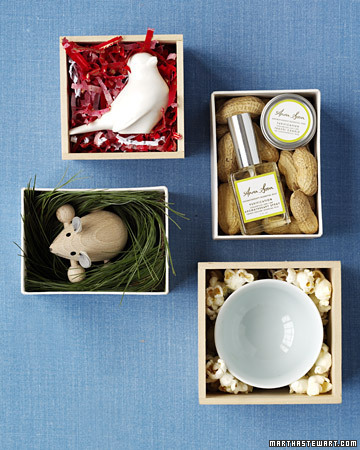 And here is some more Christmas inspiration from the Martha Stewart Website . 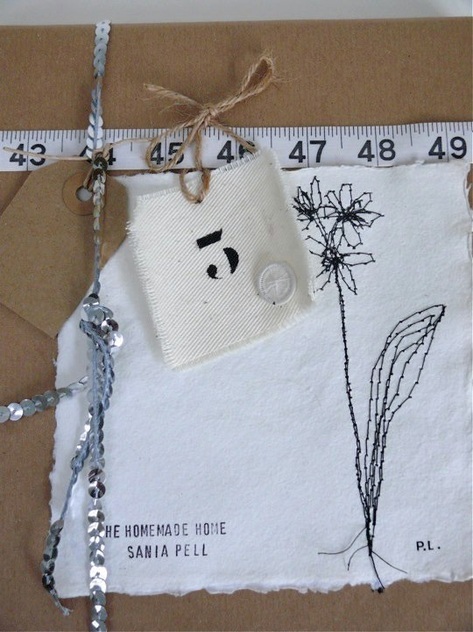 These gift tags have been made with recycled Christmas cards. These gifts have been wrapped in artwork created by the kids and they have been decorated with pipe cleaners, string and ribbon. Finally, here are some other beautiful ideas that I found from online! 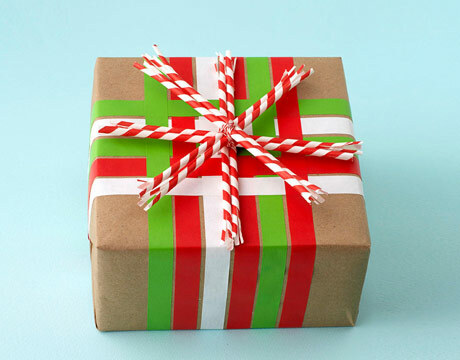 So, whether your beautifully wrapped gifts are stacked under your Christmas tree, mailed to your loved ones or hand delivered to your family and friends on Christmas day, I hope you find some of these Christmas wrapping ideas might help to make your Christmas gift exchange extra-special and memorable this year! Great ideas! 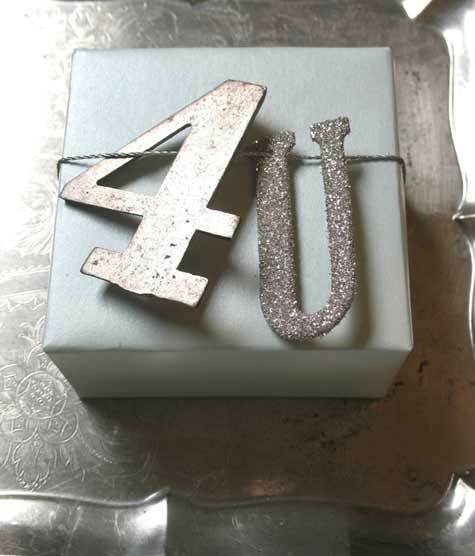 I love the 4U and the burlap wrapped ideas especially. I also loved the from my kitchen to your belly. All the ideas are nice but the one from Japan I love it. It's great that we can learn new things all the time. NAtasha...good morning (here it's 9.30 am)....this is a great post with great ideas...THANK U!!!! thank you for sharing this nice ideas with us. Wrapping is every year a theme. We have in Germany a lot of wonderful printed Christmas paper. But after unwrapping the living room looked almost like a garbage dump. So we decided to chance the way of wrapping. I will post about it in December. 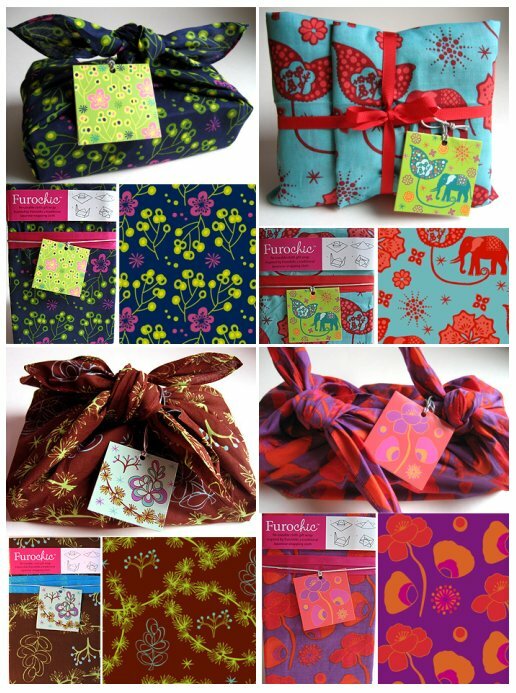 Thanks so much for sharing these wonderful ideas for wrapping. Fabulous. 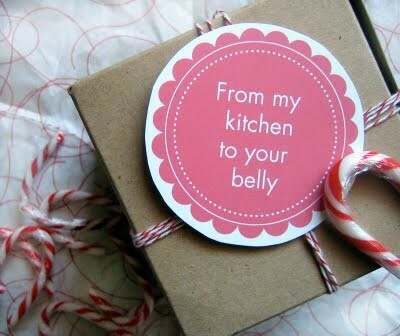 Love that tag that reads, "From my Kitchen, to your Belly." Too funny. Lots of great ideas in your post today. Thanks for sharing. 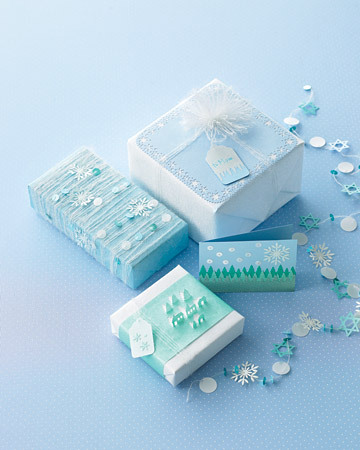 Loved looking at all the beautiful gift wrapping ideas! 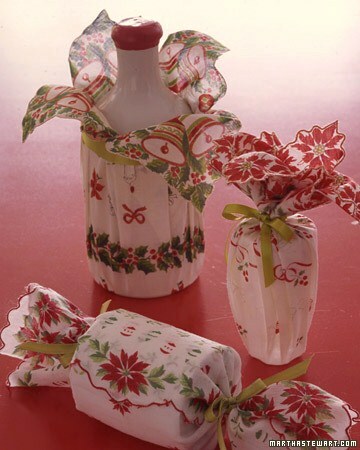 I never would have thought to use doilies or recycled Christmas cards...and Martha Stewart is the queen of decorating! Nice post! So many wonderful ideas. I think "4U" is my favorite. Ooo the white is my favorite! I also love the blue and white gift. I love seeing all of the different ideas, thanks for posting! Oh so many good ideas!!!! The 4 U is my pick! Love the paper rosette packages, as well. They are all great ideas. Can't wait to wrap Christmas gifts, this year. Thanks for the inspiration! Hi Natasha. I've been stopping by every now and then for a little while but thought it was high time to tell you how much I love this blog. A trip to Canada at Christmas time in 2006 changed the way I view Christmas and now I love enjoying the whole season. Your blog certainly helps me do that, so many fantastic ideas and inspiration all in one place! Thank you! Wow, those are so beautiful! 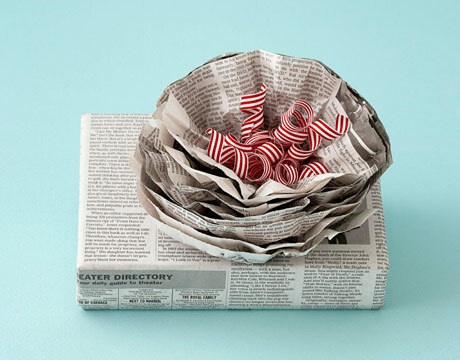 Love the popcorn around the bowl packaging idea! How cool is that! 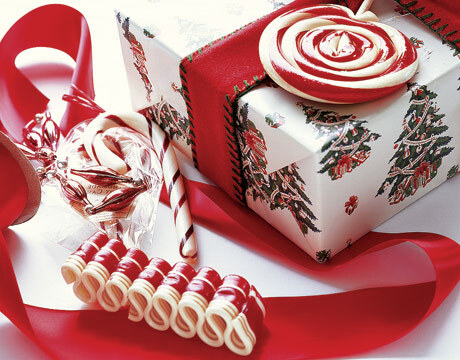 Holy Cow- My in-laws are the best wrappers ever and now with all these ideas I may just blow their minds this year!!!! Thanks so much for those. WOW- love it! I love it all! I am considering making some small table cloths (tea cloths) and wrapping some of my gifts in these. And I definitely took note of some of the "packing peanut" alternatives; those foam peanuts are awful!!! What a boatload of cute ideas...love that shirt all wrap up!! 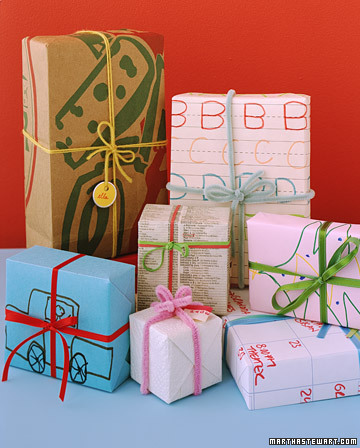 Lots of great ideas for wrapping gifts. Thanks for sharing. 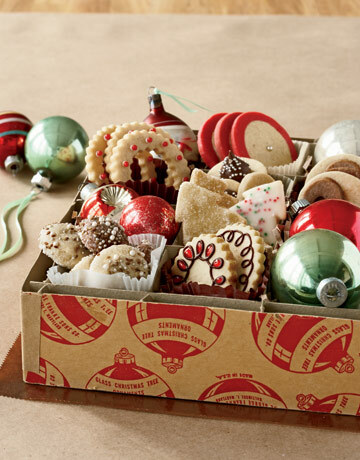 Such fun ideas - I am always drawn to Martha Stewart! Those are some excellent ideas. I LOVE the butterflies. I have a cute butterfly punch I could do that with. 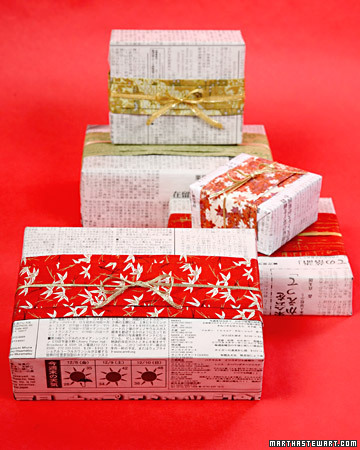 I also love the simple kraft paper with pretty ribbons. Thanks for sharing the Christmas Spirit with us and thank you so much for reading Words of Me Project. I appreciate your comments! You are so sweet,thank you! I´m sorry you didn´t win this time. But please join in for my next giveaway. I´ll post it today or tomorrow at the latest. Wrapping the presents is about the only aspect of Christmas that I really do not enjoy, but some of the ideas could change my attitude on the subject. Thank you for sharing. That is awesome! I would love for you to come link up at our Strut Your Stuff Party! 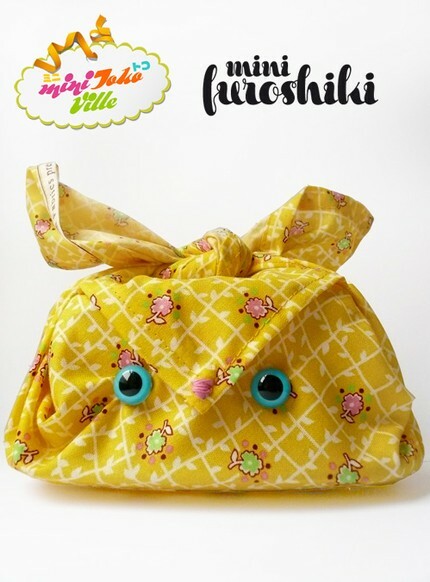 I love furoshiki - it's great to see you post about them. 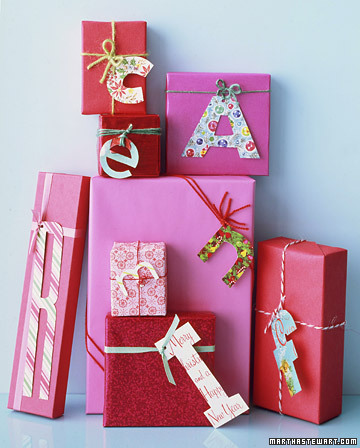 And what an impressive compilation of gift wrapping ideas in general! 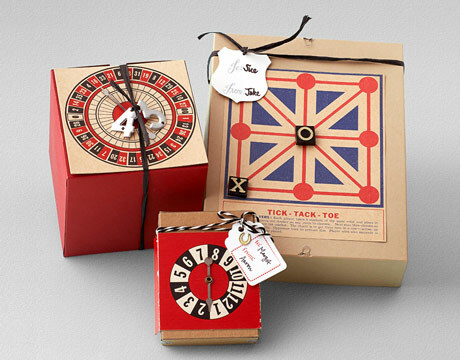 I hope your Christmas gift wrapping process is a fun one this year! First of all, HAPPY BELATED BIRTHDAY!!! Thanks for the inspiration, these are great. 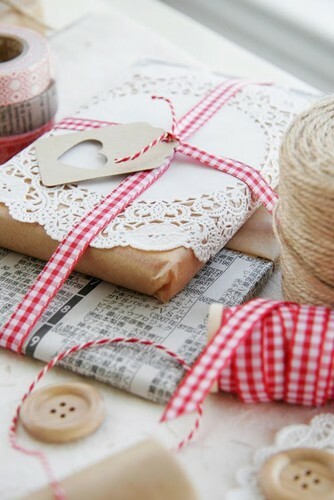 I am all about brown paper, dress it up with glitter tags and a satin bow, nothing prettier! What a fun post. I always try to have a different wrapping theme every year. Thanks for sharing all of these great ideas. This was really a journey around peoples creativity. Love those butterflies. Happy Pink Saturday. Hey, I'm having a giveaway! Wow! These are some great ideas! Didn't even know you had this blog. Love it! Wonderful! 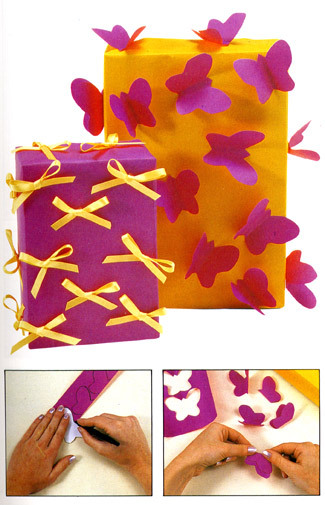 My mother has been using many of the ideas using recycled papers, cloth, lace, ribbon and whatever forever! Happy Pink Saturday! What an amazing collection of ideas. 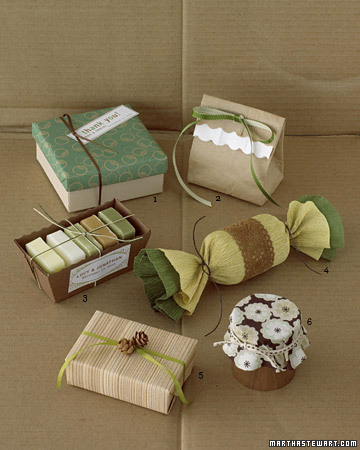 I am really drawn to the brown paper wrapping and I adored the 4 U tags added on. I love to make my wrapping for special friends unusual. Thanks for all of the wonderful ideas for Pink Sat. 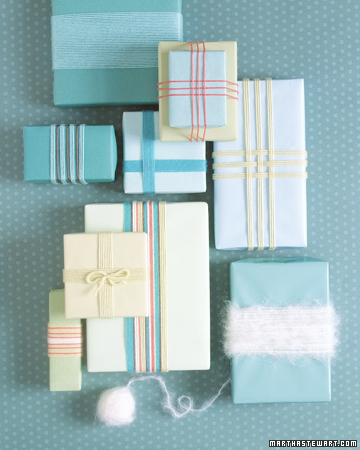 Soooooo many wonderful gift wrapping ideas-thanks for sharing them with us! What a clever and inspiring post. I love all the wrapping inspiration, it's my favorite thing to do. This post is too wonderful to put in the archives. Let me know I would love to put a link to this on my sidebar of my Christmas blog. You are so inspiring, and I am so glad that I found you and your numerous inspirational blogs. Those were some of the best ideas I ever seen! Great job of picking the best of the best! Hi, I just found your blog through Pink Saturday and love it. These are all such great ideas, thanks for the PDF file, I'm sure going to use some of these ideas, they are so fun. Wow they make my envelope with a check in it look really plain....lol..I love all those ideas to make your package look like a gift too. Happy Pink Saturday. Oh my this is fabulous! 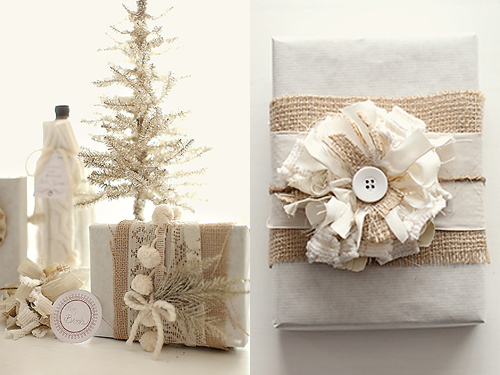 Of course i am digging the too cute white and burlap ideas! What can I say, Natasha? I love them all, and I love presents. What a huge, wonderful assortment of pictures and reference you have here!!! love it. I came over from PK: this is a fun linky party, no? Questo commento lo scrivo in italiano perche' mi riesce meglio......che pacchetti meravilgiosi!!!!!! Thanks for helping me Keep the Christmas Spirit Alive! 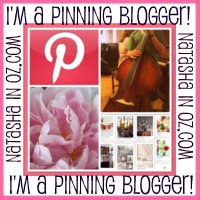 Follow Natasha in Oz @ natashainoz.com's board Always thinking of Christmas on Pinterest. I'm a Pinning Blogger. Are you? Please come and visit me at my other blog, Natasha In Oz! 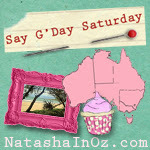 Come and link up your favourite post of the week at my weekly Say G'Day Linky Party each Saturday! Blogs that Keep the Christmas Spirit Alive! M.I.A: Where the heck have I been?!?! 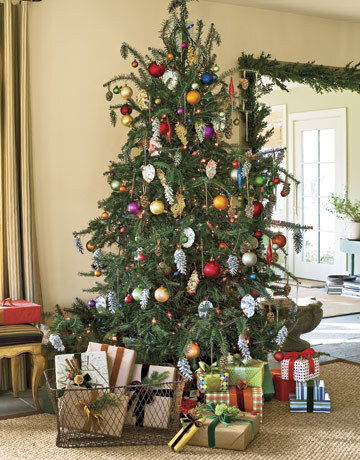 When should you plan for Christmas in 2015????? RIGHT NOW!!!! 25 ways to decorate your stairs & banisters this Christmas! Decorating Ideas for your Christmas Stairs! Red and White Christmas Tablescapes. I'll be Home for Christmas ~ Decorating the Exterior of your home for the Holidays. Looking for some Christmas Ideas? A couple of things to share! Sunday Song-God Bless us Everyone!